Will the Stock Market Determine Trump's Fate? Yes it will, according to "socionomic" theory, which holds that societal mood regulates both stock prices and public perception of leaders. Those who want President Trump to stay in office should hope the stock market rises. Those who want him ousted should hope it crashes. Why? History shows that the stock market is a useful indicator of people’s attitudes toward whomever is president. Socionomics theory proposes that society’s overall mood regulates both stock prices and the public’s perceptions of its leaders. Positive social mood makes society feel optimistic, bid up stock prices, and credit leaders for people’s good feelings. 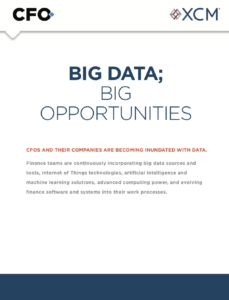 (It even may influence baseball statistics.) Negative social mood makes society feel pessimistic, sell stocks, and blame leaders for people’s bad feelings. These tendencies are evident in presidential re-election outcomes. Presidents Hoover and Carter, for example, lost bids for re-election during trends toward negative social mood as reflected by declining stock prices. In fact, the stock market is a better re-election indicator than inflation, unemployment, and GDP growth combined, as the Socionomics Institute demonstrated in a 2012 paper. 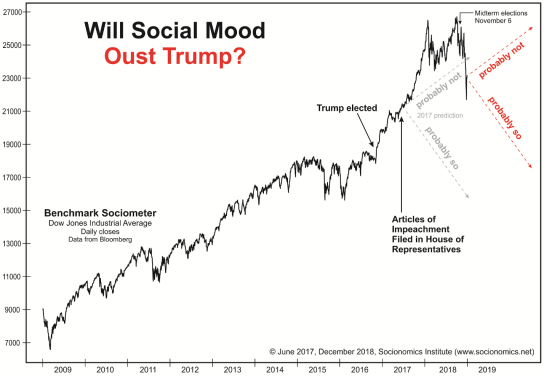 Social mood’s influence is also evident in the results of U.S. presidential impeachments and near-impeachments. Twice in its history the U.S. House of Representatives has voted to impeach a president. In both cases, social mood was trending positively, as reflected by rising stock prices, and in both cases, the Senate voted for acquittal. The graph below illustrates the timing of the first presidential impeachment. On March 2, 1868, the House formally agreed to 11 articles of impeachment against President Andrew Johnson. The Senate took three separate votes, each falling one vote short of the two-thirds majority necessary to remove Johnson from office. The Senate acquitted Johnson on May 26, 1868, during a stock rally that added to the 250% increase since October 1857. 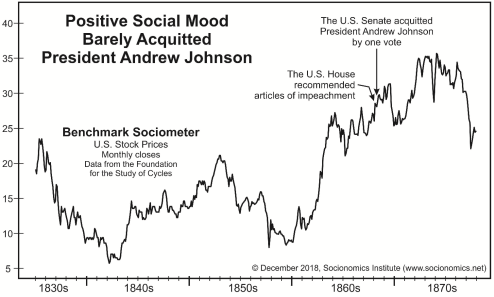 The next graph, below, shows that a substantial trend toward positive social mood preceded President Bill Clinton’s impeachment in the House and subsequent acquittal in the Senate. Note that some of the most serious events in the Monica Lewinsky scandal coincided with the largest downturn in the Dow during Clinton’s presidency. Yet, as the Dow recovered, so did Clinton’s approval ratings. 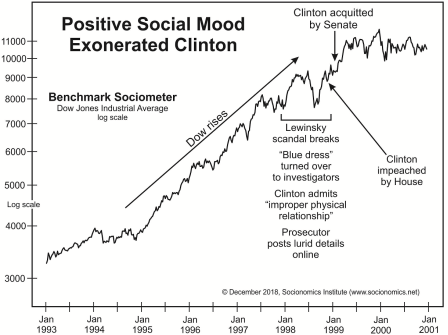 And despite a $70 million prosecution of Clinton’s related perjury and obstruction-of-justice charges, the Senate acquitted the president as positive social mood lifted the Dow to important peaks. President Richard Nixon’s near-impeachment and resignation from office serve as a textbook case of how social mood influences the fortunes of public figures. The graph below shows the Dow Jones Industrial Average surrounding Nixon’s time in office. The soon-to-be-infamous Watergate break-in occurred toward the end of a strong 67% rally in the Dow from May 1970 to January 1973. 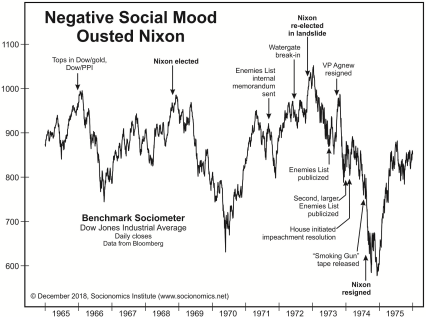 That trend toward positive mood helped Nixon win re-election in a landslide. But as mood trended toward the negative, the public’s view of its leader darkened, its appetite for scandal increased, the investigation accelerated, and Nixon’s fortunes changed. With almost certain impeachment looming, Nixon became the first president to resign from office on Aug. 9, 1974. What does this history tell us about the probability that President Trump will serve a full term in office? We considered this question in the June 2017 issue of The Socionomist. The graph below was presented there and is updated here to the present. It depicts the trend of social mood as reflected by the Dow. We left the gray arrows showing our 2017 analysis in place, and we added red arrows to indicate the possibilities going forward. In July 2017, Rep. Brad Sherman (D-CA) formally introduced an article of impeachment against the president in the House. Yet as the market rose during 2017, President Trump — despite low approval ratings, tremendous staff turnover, unrelenting criticism from the political left, and numerous indictments and charges against Trump associates in the ongoing Mueller investigation — did not face an impeachment vote. 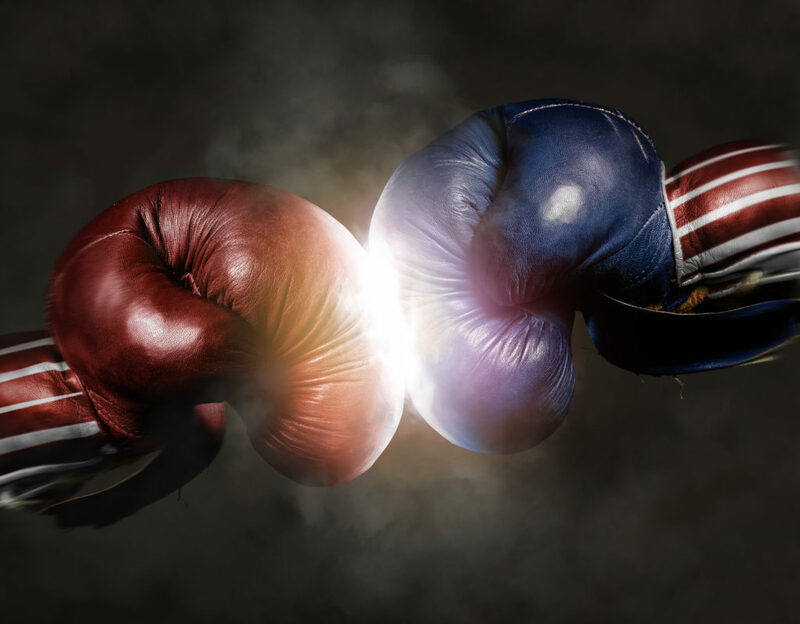 After the stock market peaked on Jan. 26, 2018, however, the tone changed, and even some on the political right became more critical of the president. Since the more recent Oct. 3 stock market peak, disapproval of the president has grown steadily louder and more strident. At the same time, the Mueller investigation has implicated more and more of the president’s inner circle in illegal activities. The Democrats won control of the House in the 2018 midterms. A Nov. 26 Gallup poll revealed that Trump’s disapproval rating had hit an all-time high. On Dec. 10, Fox News senior judicial analyst Andrew Napolitano said Trump could be charged with “three separate crimes and could be indicted while serving as president.” By Dec. 17, the Mueller investigation had issued more than 100 criminal counts and charged 34 people, 10 of whom have been found guilty. Of course, stalwart supporters of the president remain. Yet the number of oppositional voices is rising. A Dec. 19 NBC News/Wall Street Journal poll found that 41% of Americans favored impeachment hearings. We don’t know what the Mueller investigation will ultimately reveal, but for Trump, the facts may not matter as much as the social mood. 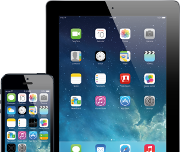 Fasten your seatbelt and keep your eyes on stock market indexes, our best reflection of the social mood trend. Alan Hall is a senior analyst at the Socionomics Institute. Only if the market rises. Otherwise, it is the fed’s fault.